Our team has partnered with Dare2Share on multiple projects over the past years, so when Dare2Share proposed an idea about Spanish websites in order to share the gospel, we were happy to jump on board! With the web, lingual boundaries are a thing of the past! 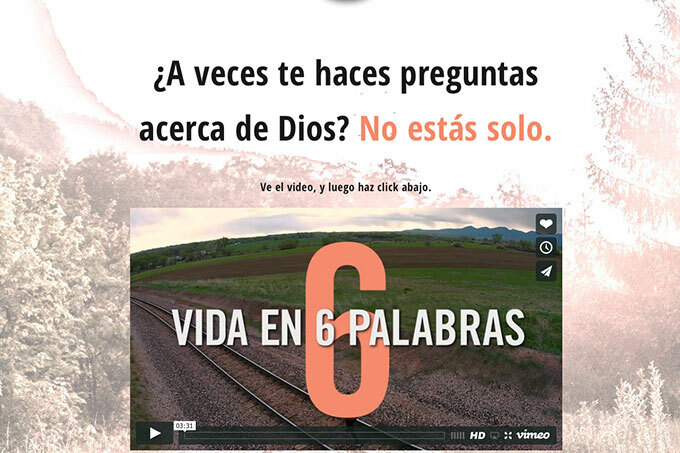 Vida en 6 Palabras (Life in 6 Words) focuses on the unbeliever, seeking a relationship with Jesus. It uses the Spanish language to connect with native speakers regarding their questions about Christ. With intentional design, PIXL joined the movement to spread the gospel beyond our boundaries. Join us as we use web design to push limits & reach unreached places. Joshua is the visionary leader behind PIXL Designs. He spends his days building a team that believes in the power of design and simplicity to help make a positive impact in people's lives. Joshua loves encouraging others to pursue their dreams and routinely speaks at conferences and events around the country. When he's not working you can find Joshua spending time traveling with his family or in the desert, backwoods, or mountains, hunting and enjoying the outdoors.